If you ask someone to define the word hell you will hear a variety of definitions. Many people define hell as an eternal destination of the wicked. Some define hell as a time period a person goes through when they’re reincarnated from one life to another. Others define hell as the habitation of the dead, while others yet say that hell is simply nothing more than something that is difficult to experience. The Bible uses words Hades, Sheol, and even Gehenna when referring to hell. For Christians, a question then becomes, is there a difference between Hades, Hell, and Sheol? A Bible study will provide us the answer to this question. Old English- hel, helle, “nether world, abode of the dead, infernal regions,” from Proto-Germanic- haljo, the underworld” (cognates: f. Old Frisian- helle, Dutch- hel, Old Norse- hel, German- Hölle, Gothic halja- hell”) “the underworld,” literally “concealed place” (compare Old Norse hellir- cave, cavern”), from PIE kel- “to cover, conceal” “to cover or hide” (1). How does the Bible define hell? The Bible uses the word hell 54 times throughout the Old and New Testaments (KJV). The first mention of the word hell is found in Deuteronomy 32:22 as follows: “For a fire is kindled in mine anger, and shall burn unto the lowest hell, and shall consume the earth with her increase, and set on fire the foundations of the mountains.” In this passage, the Lord saw that there were Israelites who were practicing idolatry and not honoring the “Rock of salvation” that created them (Deuteronomy 32:1-25). The Lord further described how they would be consumed in his anger and shall be burned in the lowest hell, which sets on fire the foundations of the mountains. He also described this place as the place he will send them where the teeth of beasts and the poison of serpents will attack them so that they will experience a continual terror. The Hebrew word used for hell in this verse is the word Sheol, which is used to describe the underground world of the dead. If we combine this word with its description from the Lord, Sheol can be described as an underground location where people who have rejected God are tormented by fire, the gnashing of teeth of beasts, and the poison of serpents. In this verse, the word hell comes from the Greek word, Gehenna. Gehenna was commonly known as the name of a city dump outside of Jerusalem where people burnt their trash and the fire never went out. Jesus used this word for hell in Mark 9:41-48 as a comparison to the fires of hell that never go out as described in the Old Testament. In the New Testament, whenever the word hell was used to describe the underground location where people who have rejected God are tormented forever by fire, the gnashing of teeth of beasts, and the poison of serpents, a different Greek word was used. This word was the word Hades. 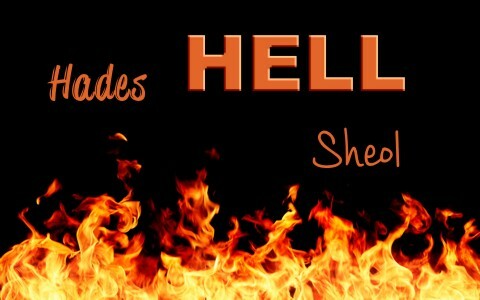 Hades is the New Testament Greek word for the Old Testament Hebrew word Sheol. We know this because Peter used the word in Acts 2:27 when quoting from Psalms 16:10 which uses Sheol when referring to Hell: “Because thou wilt not leave my soul in hell (Hades), neither wilt thou suffer thine Holy One to see corruption.” (See also Matthew 12:40; Ephesians 4:9-10, and Philippians 2:9-10 with references to Christ being in hell located in the center of the earth). Can the word hell simply mean the grave? Some say that there is no hell as a place for eternal torment and suffering. Instead they say that hell is only the grave. However, they base their belief on a few verses where the words Sheol and Hades were translated as grave or pit. The problem with this is that the references that are used deny the context of what is being presented. When you look at the context you find many problems with translating Sheol and Hades as a grave, which is normally the Hebrew word qeber. There are many graves, but only one Sheol or Hades. Man can put someone in the grave (qeber), but never puts anyone in Sheol or Hades (1 Kings 13:29-30). Man can touch a grave (qeber), but does not touch Sheol or Hades (Numbers 19:16). Someone can have their own grave (qeber), but the Bible never speaks of each person having their own Sheol, or Hades (2 Samuel 3:32). Is there another meaning of the word hell? Finally, there is one more word that is translated as hell, which is the Greek word Tartaroo in 2 Peter 2:4 where God chained the wicked angels that sinned in Genesis 6:1-4 (See also Matthew 25:41; Jude 6). Tartaroo, commonly known as Tartarus, is understood in Biblical Greek as being the deepest abyss of Hades (2). Many people have differing definitions of the word hell. Hell is commonly defined as nether world, abode of the dead, or infernal regions. The Bible defines hell as an underground location in the center of the earth where people who have rejected God are tormented by fire, the gnashing of teeth of beasts, and the poison of serpents. The Hebrew word Sheol is defined the same as the Greek word Hades. The word Sheol or Hades do not simply refer to a grave. One other Greek word translated as hell is the Greek word Tartaroo, which is the deepest abyss of Hades. More about hell here: Is There Really a Place Called Hell? Resources – Scripture quotations are from The Holy Bible, King James Version. (1) Google. (2014). “Apostle”. Retrieved from Google, https://www.google.com/?gws_rd=ssl#q=hell+etymology. (2) Strong, James. New Strong’s Exhaustive Concordance of the Bible. Strong’s number G5020, Nashville, TN: Thomas Nelson Publishers, 1990. I will like to have more knowledge and fact concerning Tartarus, Gehenna,Hades, Hell, Paradise. I want to know more about this 5 places. Previous post: What Does The Bible Say About False Prophets?